We are used to others covering for Martha’s occasional cancellations, but this substitution may be unprecedented. She has agreed, at three days’ notice, to take over for an unwell Maurizio Pollini at Renaud Capucon’s Easter festival in Aix-en-Provence. Pollini also pulled out of at least one recital (Amsterdam) last month. Fabulous to be able to hear Mme. Argerich and a sad day to be deprived of Mr. Pollini. They are Two greats whom we will all miss …someday! I saw Pollini in Vienna in 2011 and was very unimpressed. He played the Schubert D960 on his own piano, It was rushed, hard-driven and uninspired. A truck was out the front with his name on it and that of his piano and I wondered if he’d taken up another profession!! Sorry you were disappointed. However, I think history will survive your assessment. I’m only sorry that history wasn’t there that evening to justify the huge Euros it cost me. Sometime in 1980s Maurizio Pollini played Brahms’ Second with our orchestra: his playing was superb throughout in both interpretation and execution, but unfortunately his attitude and behavior during rehearsals were rather unpleasant. Between eight and ten years ago I attended his all-Bach recital in Berlin: this time his playing was mediocre at best, both technically and musically – extremely underwhelming and hugely disappointing. I don’t find it so surprising. Argerich has performed a decent amount with Capaucon (at least I’ve seen a few chamber concerts on tv) and she’s not replacing just anyone. 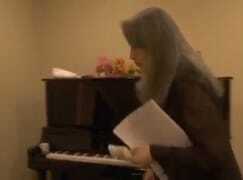 Argerich and Kovacevitch in a duo recital on the date of Pollini’s cancelled recital. Have you seen this. Kovacevich turns up in this film. Thank you! Too long to watch in its entirety, but I sampled some scenes with Kovacevich. He seems like an interesting person. His Beethoven also sounded exquisite. He richly deserves to play with Argerich. Also, I agree with your opinion on Pollini, though he was my hero in my late teens – back in the early 80s. Maybe after the mid-80s he evolved in ways I can’t relate to. I’ve heard this opinion from others too. Unprecedented? Two precedents come to mind, both from many years ago. The first was a prom in the early sixties at which Yehudi Menuhin substituted for Alberto Lysy. The second was scarcely credible. At a Belfast Festival concert in 1968 the indisposed Raymond Lewenthal was replaced by Sviatoslav Richter. Five years ago, Pollini cancelled a program with the Philadelphia Orchestra – and was replaced by Maria João Pires. Not bad at all! I recall reading Schyler Chapin’s memoir a few years ago and he told of the time when, as MET chief, he had to go out before the start of La Boheme to announce that Franco Corelli was ill and wouldn’t be able to sing Rodolfo. Substituting for him would be…Luciano Pavarotti. She’s in great form this week, going by her concert in Berlin last Saturday. Wicked tongues said that M-W Chung hadn’t made enough time to get his pianism back into shape. If Martha now cancels herself, who could possibly continue the upward quality curve?